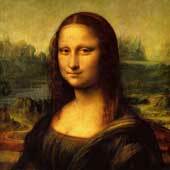 Leonardo was very absorbed with the theme of Leda during the time he was working on Mona Lisa and while in Milan he made many sketches of the swans in the moat around the Castello. 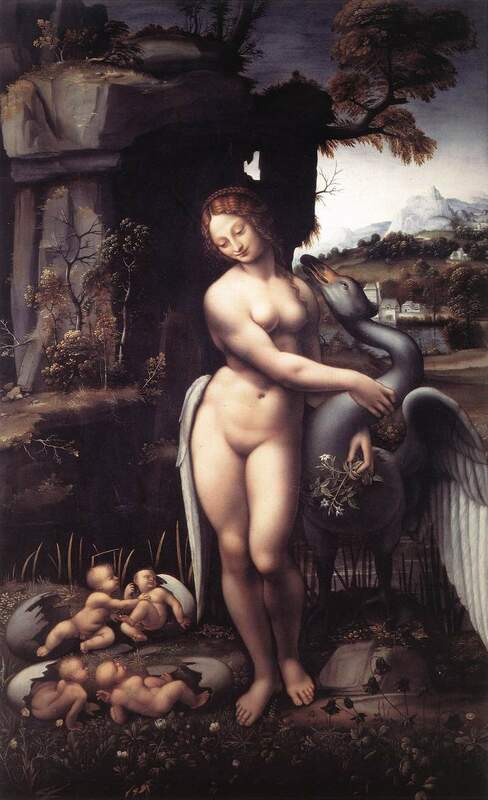 The picture was described by Cassiano del Pozzo in 1625; at this stage it was in the royal collection in Fontainebleau: "A standing figure of Leda almost entirely naked, with the swan at her and two eggs, from whose broken shells come forth four babies, This work, although somewhat dry in style, is exquisitely finished, especially in the woman's breast; and for the rest of the landscape and the plant life are rendered with the greatest diligence. Unfortunately the picture is in a bad state because it is done on three long panels which have split apart and broken off a certain amount of paint." 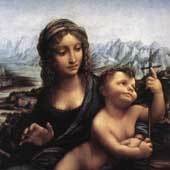 Of the two cartoons Leonardo did for this work one showed Leda kneeling and used mostly curved lines to suggest a writhing movement which emphasised fertility; the other had her in a standing position. In the final painting Leda was in the second of the two poses and seeming to recoil from the swan, while at the same time showing a shy attraction towards it. 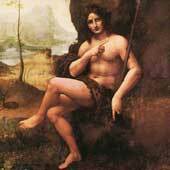 Leda's head was modestly lowered giving a virginal look, in contrast her figure was opulent, a mature body with a young head on her shoulders. 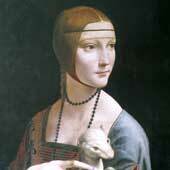 Like many of Leonardo's subjects her hair was painted in minute detail. 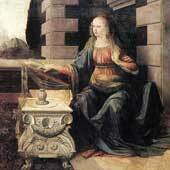 She was surrounded by the most fertile landscape that Leonardo -- by this time aged 54 -- had produced since his workshop days. The swan was Jupiter in one of his many disguises and the babies were Castor and Pollux, and Helen and Clytemnestra.